Redmond, WA, April 11, 2019 --(PR.com)-- Denali Advanced Integration, a global leader in delivering enterprise IT solutions and services, announced today that CRN, a brand of The Channel Company, has named Denali to its 2019 Tech Elite 250 list. This annual list honors a select group of North American IT solution providers that have earned the highest number of advanced technical certifications from leading technology suppliers, scaled to their company size. These companies have distinguished themselves with multiple, top-level IT certifications, specializations, and partner program designations from the industry’s most prestigious technology providers. 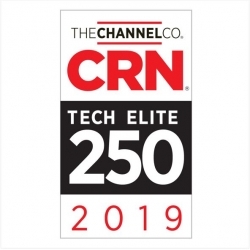 "CRN’s Tech Elite 250 list recognizes solution providers with extensive technical knowledge and premier certifications," said Bob Skelley, CEO of The Channel Company. "Pursuit of vendor certifications and broader skill sets in a wide range of technologies and IT practices, proves a solution provider is committed to delivering maximum business value from those technologies and giving their customers the highest level of service." "Technology continues to evolve at an incredibly rapid rate. Customers are challenged with keeping pace with the transformation of business and technology," said Clayton Daffron, Director of Solution Architecture at Denali. "At Denali, we take great pride in helping customers navigate through these changes by having in-depth knowledge of the key technologies needed to move their business forward. Thank you to our technology partners and CRN for helping us achieve the Tech Elite 250 distinction."